Karachi isn't only a popular city in Pakistan, but also one of the most fascinating cities in the country. If you're looking for Karachi flights, we at Rehlat offer cheapest flights to Karachi with best price guarantee. Save more on your flight and spend on your destination. Sign up for the newsletter from Rehlat and be updated on Karachi flights discounts and cashback coupons. If you are a last minute believer, be surprised with the enormous last minute deals on Rehlat for every Karachi flight booking. Being the second largest city in Pakistan, Karachi is a treasure trove of natural, historical and cultural gem. Karachi is one of the most prestigious destinations that draw a lot of travelers from all corners of the world. It is filled with beautiful highlights that you would love to visit again and again. Karachi has some of the best iconic landmarks including Mohatta Palace, Frere Hall, Clifton beach, Port Grand, and Dolmen Mall Clifton. Karachi is a beautiful city with rich history and glorious past. It is one of the most visited cities in the country and is filled with countless historical sites including Merewether Clock Tower, Wazir Mansion, Chaukhandi Tombs, Jehangir Kothari Parade and Pakistan Air Force Museum. 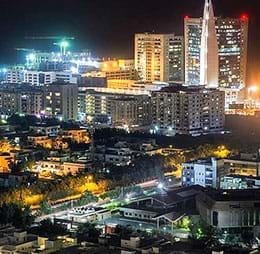 Karachi emerging as one of the top rated shopping destinations in Pakistan with its luxurious shopping malls, bounteous, department stores, old markets and street shops. There is also the mixed combination of the traditional dresses that influence the lifestyle of Karachi. Check out places like Sharah-e-Sher Shah Suri, Clifton, PAF Museum Rd, Kheyaban-e-Roomi, Zamzama Blvd and much more. Karachi is considered as one of the Asia's best dining destinations which boasts of dozens of delicious local and international cuisines like biryani, Creamy moong daal, keema, haleem, and chicken jalfrezi. Check out for places like Kolachi Restaurant, Sajjad Restaurant, Hakka Chine, Karachi Marriott Hotel and China Town. Karachi has one of the largest transportation networks in Pakistan. There are various modes of vehicles including public buses, trains, taxis, auto rickshaws and cars. Jinnah International Airport is the major airport in Karachi that serves domestic and international flights to all major destinations. It is the primary hub for Airblue, Pakistan International Airlines, Shaheen Air, Serene Air, Star Air Aviation, Vision Air International, and Princely Jets. The main terminal handles both domestic and international operations. It is equipped with shops, cafes, restaurants, ATM's, and much more. Karachi offers various modes of transportation vehicles including public buses, taxi and vans to reach the city center and other neighborhood cities. Taxi serves and airport shuttles are available 24/7.